Employees working at remote locations such as mines or construction sites often find it difficult to mark their attendance accurately. Manual attendance management is often erroneous, giving rise to exploitation of the employees in terms of incorrect or delayed salary payments. To solve such issues you may think of implementing an automatic, biometric attendance solution. However, with remote locations installing the device is yet another challenge. To overcome this issue, Matrix has come up with a novel battery back-up unit for its attendance marking devices. The COSEC VEGA device that you would be using for attendance marking comes with a battery back-up unit. This enables the device to function on battery power for up to 5-6 hours. You will not be required to install the device with any kind of wiring. The respective authority can go to each user and have his or her attendance marked on the device. Moreover, this device is made available with 3G connectivity/Wi-Fi, which transfers attendance data to the COSEC server in real-time. Let us discuss some of the common challenges that COSEC VEGA BBU can help eradicate and its benefits. Work areas such as remote construction sites or manufacturing units do not have a fixed place where the device can be installed. For such work areas, VEGA BBU can prove to be a perfect solution. This device can also be used for makeshift sites like changing government project sites, office transport vehicles or school buses, etc. Sites where employees are spread across a large area or have long distances between their work area and head office, the COSEC VEGA BBU can help in collecting accurate attendance data. 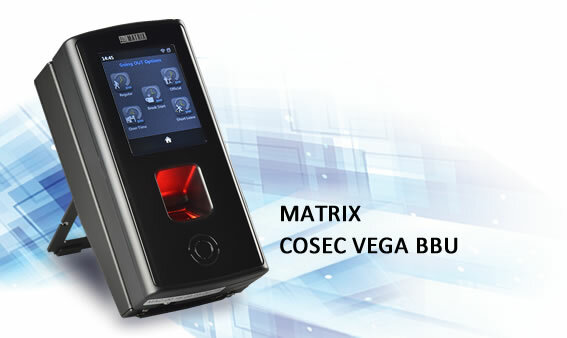 Access Control, Matrix COSEC access control, COSEC, Matrix, VEGA, VEGA BBU. permalink. I discovered your blog site on google and verify a few of your early articles. Always keep up the very good run. I recently extra up your RSS feed. I’m quite pleased with the intrfmaoion in this one. TY! We truly appreciate your website post. You’ll find a lot of methods we could put it to great use with minimal effort in time and hard earned money. Thank you really for helping make the post answer many questions we have had before now. Astonishingly well written and useful for a freely available online site!